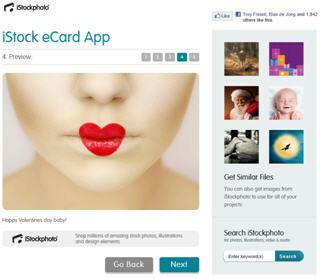 iStockphoto today announced a new app that lets anyone create fast, fun and free e-cards for use on Facebook. The iStock e-card App can be accessed via any existing iStockphoto Facebook page or http://apps.facebook.com/istockecard/. In a matter of seconds, a user can create, customise and personalise a card that can be posted to a friend’s wall or sent privately via Facebook message. With over 50 free images, illustrations and videos representing major holidays, celebrations and milestones, iStock’s e-card app makes it easy to customise an electronic greeting for virtually any occasion. The iStock e-card App is available immediately. International versions of the Facebook app have been created in German, Italian, French, Japanese, Brazilian Portuguese and English. The application is free and available to anyone with a Facebook profile. iStockphoto offers easy, affordable inspiration with millions of vetted, royalty-free photos, illustrations, video, audio and Flash® files. Using the most advanced search in the business, customers download a file every second from a collection of more than ten million files for business, marketing and personal projects. iStockphoto started in 2000, pioneering the micropayment photography business model, and has become one of the most successful and profitable user-generated content sites in the world. iStockphoto is headquartered in Calgary, Alberta, Canada, and is a wholly-owned subsidiary of Getty Images.